Aquarium Drunkard is nothing if not fans of pop music’s twisting and shaking history. 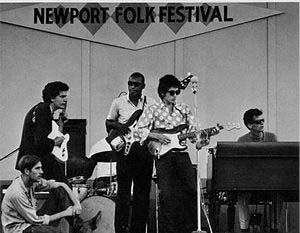 While some may point towards Woodstock as the most important music festival in the history of our young country, one could make a very, very strong case for the early 60’s incantations of the Newport Folk Festival. It was Newport, after all, that first trusted Bob Dylan enough to give him a national audience in 1963, only two months after the release of his groundbreaking second album, The Freewheelin’ Bob Dylan. Dylan’s first festival appearance heightened his national profile, which led to, among other things, Dylan’s introduction to The Beatles, a single moment in a New York hotel room in 1964 that knocked the worlds of rock ‘n’ roll and folk music off of their charted courses and into groundbreaking territory. Dylan would release the wiry, needly, rock ‘n’ folk of Bringing It All Back Home seven months later and the Beatles began to mine darker, more thoughtful territory on songs like “Help!” and “I’ve Just Seen a Face,” the latter of digs its shovels deep into Dylan’s territory. And it was at this same festival only two years later that Dylan’s hand let go of the scene and picked up an electric guitar, horrifying the folk music world (anyone who’s seen Scorcese’s Dylan documentary No Direction Home can tell you what Pete Seeger threatened to do to the P.A. system during Dylan’s ’65 set). In the single stabbing pulse of Mike Bloomfield’s guitar that opened “Maggie’s Farm,” a flurry of scales fell from the eyes of the gathered folkies; this man would not be their messiah, after all. Ah, but the times, they are a-changin’. Not only are noisy Dylan acolytes like the Pixies willing to unplug at Newport, but Bob’s son Jakob joins the acoustic fray this year without his swirling rock band, the Wallflowers. Levon Helm, former drummer for the Band (themselves Dylan’s backing group at one point), is one of the headliners, and Upstate New York’s Felice Brothers — who have sat in on one of Helm’s famous Midnight Rambles — will be there, too. Dylan’s presence, then, still looms large, even if the man himself isn’t planning on treading the boards. To quote his son, the more things change, the more they stay the same. Ahem… i timidly raise my hand, and ask if you mightn’t have meant “he single stabbing pulse of Mike Bloomfield’s guitar.” Paul Butterfield played harmonica, and didn’t back Dylan at Newport, although the rest of the Butterfield band did. Ack! Good eye, Muddy. Consider it fixed (and kudos). Good – I’m glad I didn’t timidly raise my hand. I always wondered why Woodstock had such an epochal reputation. Neport was much more important, as was Monterrey, in terms of introducing large audiences to new sounds. learn something new everyday, i alway assumed it was The Band backing him at newport. A mix of the Band (Robbie, Danko, Manuel, Hudson) and the Butterfields played with him right after in Jersey I believe. Or was it before Newport? I’m psyched to be going to Levon’s midnight ramble on Aug. 16 and Saratoga Folk the next night. I’ll probably be there too, Buffet’s actually the big draw this year….be jumping off boats, and remember Newports unofficial motto…..We are a small drinking town with a fishing problem…..